Buildings vanish into plumes of smoke, never to return, in just a few heartbeats – watch a stunning video of nearly 20 structures being completely destroyed within just 10 seconds. 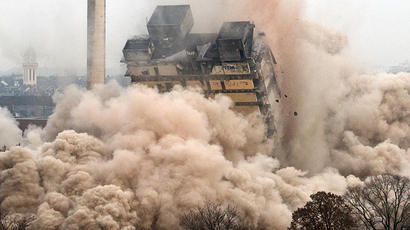 Some 5 tons of explosives were used in the demolition in central China. 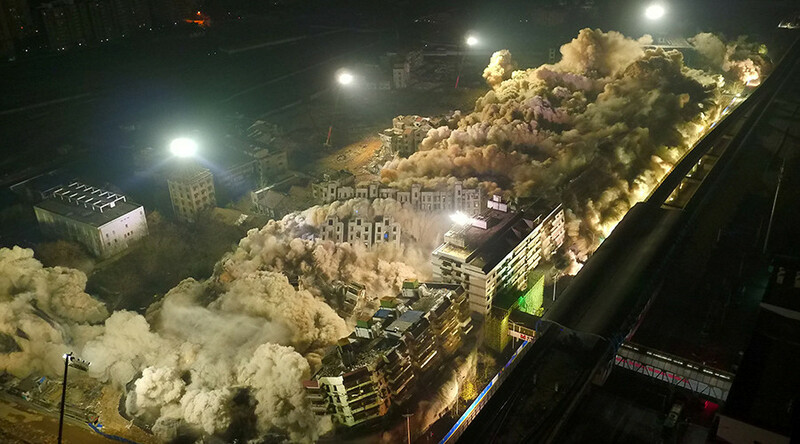 The epic explosion that took place in Wuhan, the capital city of Hubei province, leveled 19 seven to 12-story structures in a controlled demolition, the South China Morning Post newspaper reported, citing local media. “For this kind of large-scale blasting demolition conducted in the downtown area, we not only need to guarantee the demolition result, but also strictly control the adverse effects of blasting,” Jia Yongsheng, general director of the demolition, said, as cited by Chinese media. According to Jia, some 5 tons of explosives distributed in 120,000 locations were used in the controlled blast, which covered an area of over 15 hectares. “The demolition effect was quite ideal. The explosion didn’t affect the light rail and public facilities around the blasted buildings. There was no damage and adverse effects of blasting,” said Jia. This is the third controlled explosion in the area, according to the South China Morning Post. The city authorities are planning to demolish at least 32 buildings to make way for a new business center that will reportedly feature a 707-meter tall skyscraper, which is to be one of the tallest buildings in the world. Wuhan is has one of the biggest populations in China, with about 10 million residents.